I've been following our Olympiad team progress in Tromso. After a slow start, the open and women team have push the pedal to metal . With a round to go, both our open and women team has been performing well and they now stand well above their initial seeding. Moving into the final round, our open team is dreaming a Hindustani movie ending. They have been paired against "Team Carlsen" - read : Norway! As we all know, the current World no. 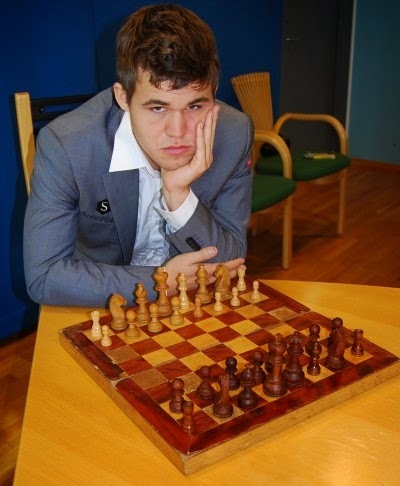 1 and World Champion in Classical, Rapid and Blitz - Magnus Carlsen is the Norway's board 1 player. This mean that our open team anchor by IM Lim Yee Weng who is also on board 1 has a chance of a life time to meet the mighty Magnus Carlsen on a real chess game. With all due respect to IM Lim Yee Weng, facing Carlsen in a official individual classical game with live broadcast watch by all chess fans all over the world would be a dream come true. In a more normal occasion, he will be glad to have a chance to play against Carlsen in a simul exhibition. However, sadly (or gladly) for Yee Weng, team Norway decide not to grant Yee Weng and all Malaysian chess lovers our wishful dream of watching live broadcast of him facing Carlsen on the final round of Tromso Olympiad. Perhaps with Carlsen who have lost two and also draw two out of 9 games, with adding factor that Norway and Carlsen has no chance mathematically to won the team and individual medal, they probably decide to rest the "heavily wounded" Carlsen. You can imagine what a bad ending for Carlsen and Norway if their board 1 and team suffer another lost, this time against Yee Weng and the Malaysian team! As a Malaysian chess lover, surely i was dreaming a typical Hindi Movie ending with the Malaysian team beating Norway in the final round with Yee Weng won on board 1 - against Carlsen - ala Kuch Kuch Hota Hai. It would be a good break for our country who is infamously received world's attention for the unfortunate incidents of MH 370 and MH 17. As meeting Carlsen will not happen, Yee Weng has to make do of facing Carlsen's mentor - GM Simen Agdestein . He is also the author of the famous book about Carslen - Wonderboy . 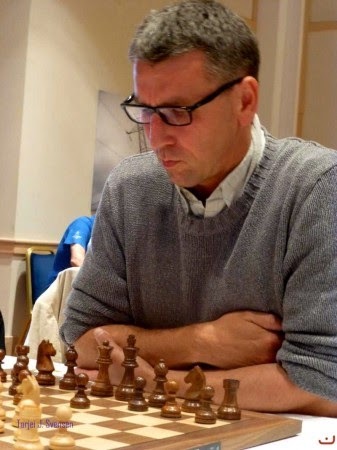 Simen is also a well known figure in chess world. He is the only person who has excell successfully both in chess and football. He is chess Grandmaster ( once world no.16!) 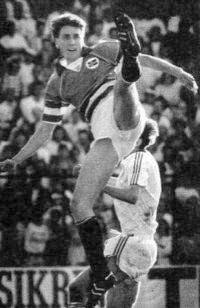 and also a fomer Norway international footballer! Carlsen not playing? Big mistake, Norway!